A rich and intense single malt whisky experience.The original 100% sherry seasoned Macallan. Shaped and influenced by a predominance of sherry seasoned Spanish oak casks this is an intensely and powerfully rich single malt with dried fruits and wood spice character. A dram to be enjoyed with friends - The style is rich, wood spice & dried fruits which delivers a powerful rich taste with an intensely matured character. The benchmark of quality, a truly distinctive icon and delivers exceptional taste every time. 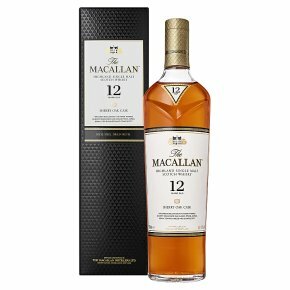 The Macallan 12 Year Old Sherry Oak Highland Single Malt Scotch Whisky possesses a dark natural colour from acorn to glass wood policy. Colour: Rich Gold Nose: Vanilla with a hint of ginger, dried fruits, sherry sweetness and wood smoke. Palate: Deliciously smooth, rich dried fruits and sherry balanced with wood smoke and spice. Finish: Sweet toffee and dried fruits, with wood smoke and spice.